Winnie the Pooh has always been a favourite of mine. 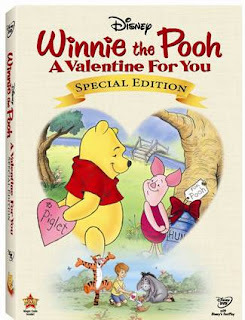 I was quite excited to sit down and watch the Special Edition DVD that just came out on DVD called Winnie The Pooh, A Valentine For You. Sadie and I sat down after her bath to watch the movie before bed. She however didn’t make it through this just under an hour event. She tried, but it was bedtime so I will let her watch it again another night. But I on the other hand loved every minute of it. Pooh and his pals set off on an exciting adventure to find the “smitten” (love bug) they think has bitten Christopher Robin. The DVD has 2 story selections and and Bonus Features of “My Hero”-New to DVD! So you get three tales in all. A Valentine For You reminds us that there’s room in our hearts for both old and new friends! I really enjoyed the songs and I always enjoy the way they take you into Christopher Robin room before going on the magical adventure of the Hundred Acre Woods. A perfect little gift for your little Valentine.